Star Wars: The Last Jedi is mired in secrecy. For some fans, that's just how they like it. Others though, they want to solve the mystery, and propose theories to explain every little detail about the movie. 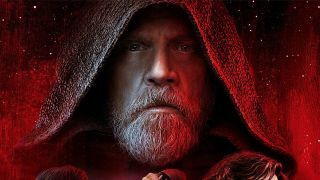 One particular theory gained a lot of traction over the week, so much so that it prompted a response from the Jedi Master himself, Mark Hamill. Hamill is known for playing with his fans. He's said he thinks of Daisy Ridley as a daughter (a joke on the mystery over who Rey's parents are) and has called actor John Boyega his son (same joke, same mystery of unknown parents). So I don't think he's being serious here. It's just fun to see the star troll us a little. Disney itself seems to be having fun playing with fans about the theory as well - this month the company unveiled a cinema display with one side seeming to represent the Light Side of the Force, the other representing the Dark Side. Luke, as it turns out, shows up on both sides.